Nicholas Ginex enters the WordPress World!! Did the Electron Begin the Universe? Islamic Republic of Iran Will Be Defeated! Dialogs on Does Consciousness Pervade the Universe? Will Science and Religion Be Compatible ? Will Islamic Leaders Revise the Qur’an? You can help stop Islamic terrorism. People must EXPOSE the Quran by communicating worldwide why and how. Worldwide person to-person communication requires the active participation by business leaders, humanitarians, media news outlets, government (Senate and Congress), agencies (such as the CIA and FBI), members of forums and political clubs. Their efforts will EXPOSE Islam’s despicable history and abominable verses in the Qur’an. Members of forums and political clubs (such as the Middle East Forum, Iran Politics Club, American Islamic Forum for Democracy, the Islamic Board, and the Stand for Peace Islamic Forum of Europe) are requested to actively support worldwide communication efforts. The object is to help Muslims understand the need to revise the Quran. Reporting of Islamic atrocities by writers and journalists in many countries keeps the public aware of the Islamic threat but that is NOT enough. Their efforts reveal Islamic extremism and its expansion but does NOT eliminate radical Islam. There is a SOLUTION. A Solution to Eliminate Islamic Extremism is to EXPOSE the Quran. Worldwide communication efforts to EXPOSE the Quran are NOT an attempt to incite anger and hate against Muslims or denigrate the religion of Islam. It will enable Muslims to understand the flaws of their religion. Understanding will enable Muslims to pressure religious leaders and Islamic scholars to implement a solution – revise the Quran. Communication Objectives to REVISE the Quran. • Inform Muslims worldwide why the Quran is the source of discontent in many countries and that it is the root cause of Islamic extremism and terrorism. • Have Muslims learn of Islam’s despicable history. • Open a dialog with Muslims to acknowledge abominable verses in the Quran and advocate God’s greatest command, love one another. • Only informed Muslims can initiate an Islamic Reformation. Key to reforming Islam is to revise the Quran with God’s great command (John 13:34, 15:12, 15:17). WHY People Worldwide Must Communicate. In 100% of mosques, imams, caliphs and mullahs teach their Muslim followers to believe the Quran is the Religion of Truth and Islam will prevail over all other religions (Quran 9:33, 61:8-10). Most Muslims are illiterate and indoctrinated with Quran beliefs from childhood and earlier. They are unaware that the Quran contains many abominable verses that incites bigotry, hatred, violence, and the murder of non-Muslims. To fully understand how the Muslim mind is indoctrinated, the following link is provided. It presents, Indoctrination of the Muslim Mind. It reveals why it is essential to learn of the insidious psychological use of “We, Our and Us” in the Quran. The plural pronouns for Allah creates for Muslims a feeling of unity with the Creator and the compulsion to impose this unity on all people with the altruistic belief that they are promoting the integration of mankind with the Creator. History Reveals Islam Was Never a Religion of Peace. People need to communicate worldwide the despicable history of Islam. This religion grew by having Islamic armies capture the lands of many countries and their captives were given two alternatives: convert to Islam and pay a tax or die by the sword. It continues to expand in many countries as Islamic followers are not able to assimilate with people with other beliefs and many, in response, commit acts of terror. 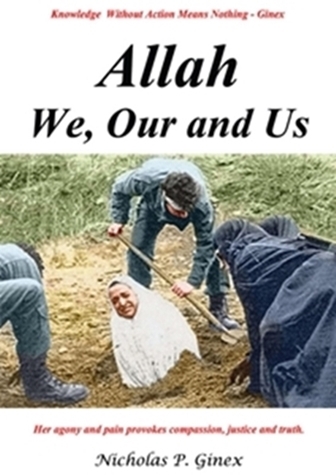 The following link offers a cut down version of the factual novel, Allah, We, Our and Us. It was written in two parts to inform people why Islam is a danger to all people around the world and to communicate why the Qur’an must be revised. Unafraid, we can communicate openly and respond to the stoning of an Iranian woman on the cover of Allah, We, Our and Us – Her agony and pain provokes compassion, justice and truth. The solution provided by worldwide communication presents an opportunity for all people to help solve the looming threat of Islam by identifying the problem and presenting a viable solution. Communication is an alternative to avert WWIII. A silent response signifies fear, unable to confront the enemy that kills millions of people in the name of an Islamic God. It is time to ‘Wake Up’ or continue to permit Islam to expand and eventually dominate the values, culture, and laws of every country. Silence is Tantamount to Permitting an Islamic Cancer to Grow. It is appropriate to end this appeal for all people to communicate in EXPOSING the Quran with a song that poignantly reveals the TRUTH about Islamic terrorism. Education is key for Muslims to succeed by revising the Quran. It can be achieved through WORLDWIDE COMMUNICATION between Muslims and non-Muslims. Education will benefit people to understand the threat of Islam and give Muslims the motivation to revise the Quran. Those of you who are willing to EXPOSE the Quran, you will be assisting Muslims to help themselves. The worldwide communication solution does not require dropping bombs on Muslims in occupied territories. Rather, it can be achieved by dropping copies of Allah, We, Our and Us into Muslim and non-Muslim territories so that they become knowledgeable of the Islamic threat and a viable solution. Worldwide communication will enable Muslims to mobilize a revolutionary movement. President el Sisi of Egypt has already indicated need for such a movement. President el-Sisi alluded to, but did not specifically identify the “source of anxiety, danger, killing and destruction for the rest of the world.” Indirectly, he said, “this thinking” that Muslims hold as most sacred “is antagonizing the entire world.” That sacred source, indoctrinated into the Muslim thinking mind, is the Qur’an. It is quite plausible that religious leaders and scholars listening to President el-Sisi knew he was referring to the Qur’an as the sacred source.